The relationship between brand and reputation has changed because the world has changed. Brand is the promise, reputation is the degree to which the promise is heard, understood and acted on…Brand is the expression, reputation the impression…Brand is “owned” by the organization and reputation is “owned” by stakeholders. We know and use these definitions to explain and justify why and how we have historically managed brand and reputation separately. But the changes we are witnessing in information, attitudes and audiences make these distinctions irrelevant. How people receive and process information has changed in ways that make delivering a corporate strategy – and building a brand and managing reputation the old way – harder. 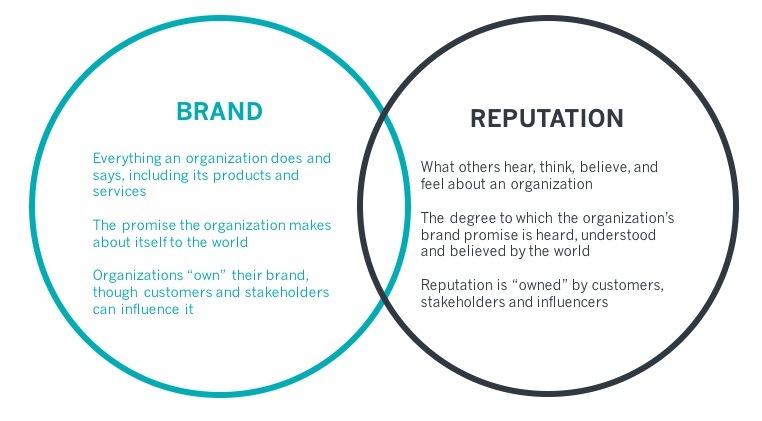 Gaps between brand (what an organization says and does to tell its story to the world) and reputation (consumers’ and stakeholders’ experience of these words and deeds) are more likely to be noticed and acted upon today than ever before. Disconnects between brand and reputation threaten not only reputation but also sales, employer attractiveness, and community and government support. We take an insight-driven approach to understanding and managing brand and reputation. Listening and measurement provide vital feedback on whether your brand and reputation are in sync. We work with clients and partners to break down the walls between organizations and their audiences – inside and outside the building – to close the gaps between what they do and say and how that's perceived. The result: a strategy that is more compelling and credible with the people critical to your success.